To those of you waiting for an updated version of my UI compilation, be patient. I hope to have it available by tomorrow. The holdup has been the lack of a working version of Power Auras for 5.0.4. However, I’ve decided to give its alternative – WeakAuras – a shot and it turns out I really like it. I’m going to go ahead and move forward with WeakAuras, so when I get all of my new auras dialed in I’ll be sure to upload the package to WoWInterface as soon as I can. Power Auras strings are not going to be compatible with the 5.0 version, which means all auras will have to be reconfigured anyway. Seems like a practical time to try something new – especially since Power Auras may not be ready for who knows how long. Here’s a screenshot of how things are looking at the moment. Gar UI is almost Patch 5.0.4 ready…almost. It’s pretty much the same as before, except I’ve added an additional trap bar above my pet bar. The intention is to allow for a few extra button slots for other cooldowns I want to monitor, plus it provides a quick and easy way to see if Trap Launcher is toggled on/off, and which trap types are on cooldown. I wanted to make a quick announcement letting you know that I pasted my current Power Auras sets last week. The individual Power Auras strings still need updating, but if you wish to try any of my PA’s, just import my entire sets and mess around with them from there. I’ve trimmed down the Power Auras that I’m using, but I’ve left any and all PA’s in the sets so others may try them out to see if they like them. Just be sure to enable them for either or both specs, or else they won’t activate. 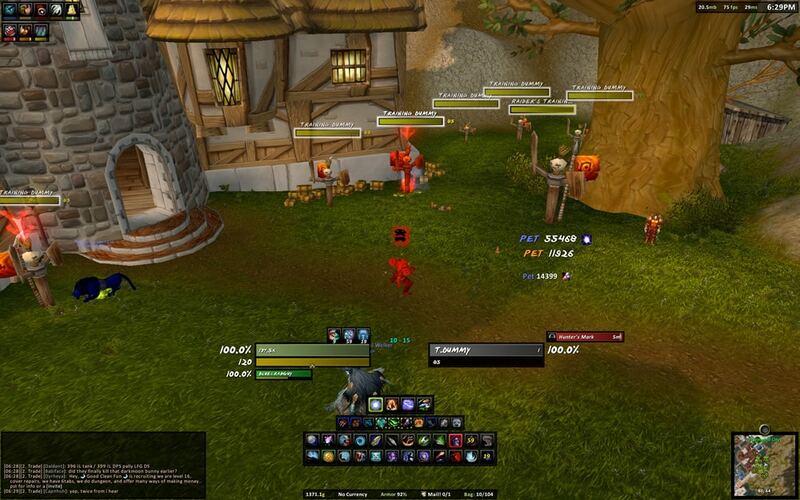 This latest version of my user interface was created with an emphasis on PvP. I removed the internal cooldown timers, as well as some of the other DPS min/maxing buff and target debuff notifications. The information I added this time around is specifically geared towards monitoring buffs and debuffs during PvP play. I also tried to minimize things even further to create a larger field of view.